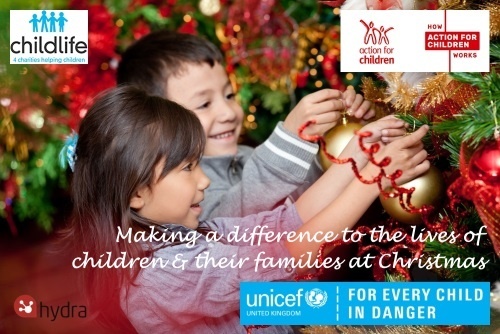 This year Hydra is again helping those less fortunate than ourselves and supporting three childrens charities; Action for Children, Childlife and Unicef UK. Action for Children has been helping the young and vulnerable for nearly 150 years, driving forward new ways to make life better for vulnerable children. They work relentlessly to fix problems early and give them the chance to grow up happy, healthy and with hope for their future. Childlife is four charities; Acorns, Ataxia UK, The National Children’s Bureau and The National Deaf Children’s Society. All of the four Childlife charities provide much needed care and support to children, young people and their families. They are able to offer practical solutions to everyday problems, as well as enabling families to get together at organised events where they can share experiences and support one another. Unicef UK work in 190 countries, including Bangladesh, Syria, Yemen, Europe and the UK helping to keep children safe by providing education, life-saving food and nutrition, clean water, vaccines, emergency relief and protection from violence. Many charities in the UK rely exclusively on public donations and the generosity of the community. Without these donations, serving those in need would not be possible. Hydra is proud to help make a difference to childrens lives all over the world. If you would like to join us in making a difference to the lives of children and their families and spread a little bit of happiness this Season, please click the charity's logo to visit its donation page. Your support and kind generosity will make a real and lasting impact to the lives of those who are still in need. Merry Christmas and a Happy New Year from Hydra!